Great optimism comes with this card, hope for a future or a hopeful future with what it is that you desire. 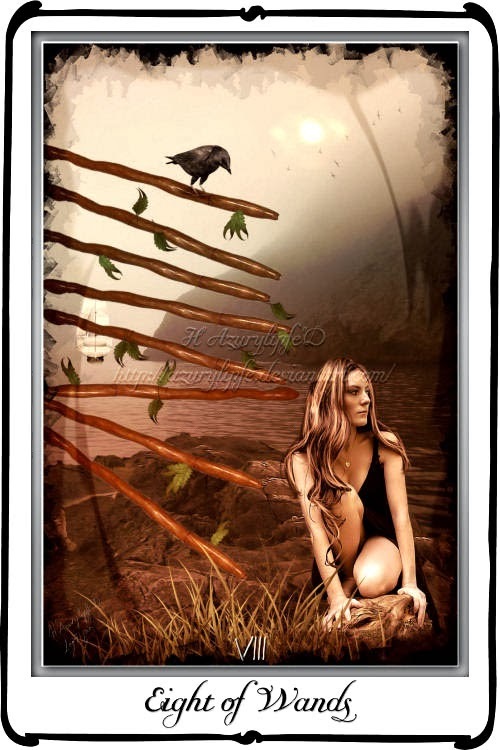 The Eight of Wands card suggests that my power today lies in conclusion. It has all led up to this moment of anticipation and "there ain't no stopping it now." I have thrown my "hat" in and given it my best shot and have just as good a chance as any -- but the outcome is still up in the air. I am ready to accept what lands, sticks, misses, or hits the fan. "When it rains, it pours." I am empowered by the potential payoff in this direction and I transform through timing or focus under fire.